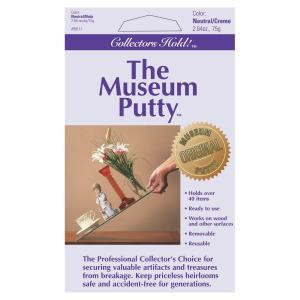 "A miracle removable putty that holds securely in place valuable crystal, glass, vases and more from accidental breakage, theft and earthquakes. Proven to deter theft and breakage, yet removes easily with a twist. It works and so simple to use! Holds 40 plus+ items. Is removable and reusable. Excellent for: Antiques, Collectibles, Plates, Glassware, Statues, Figurines, Vases, Crystal, Pottery, Pictures, Bottles, Steins, in RV's & Boats too; The uses are endless! Collectors Hold! Works On: Glass Shelves, China Cabinets, Lacquered Wood, Furniture, Painted Gloss Wood and Walls, etc. Contains 2.64oz of product"